A new online find, a set of English children's stays, they were described by the dealer as small enough to only fit a baby. 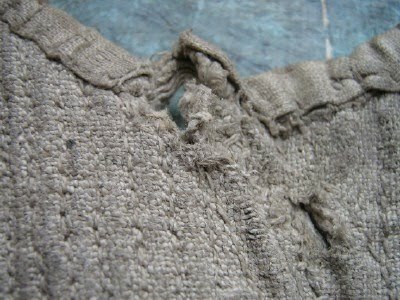 These stays have seen wear, they are not pristine and they are not fancy. Simple brown (unbleached) linen comprises the layers, both fashion fabric and inner layers. 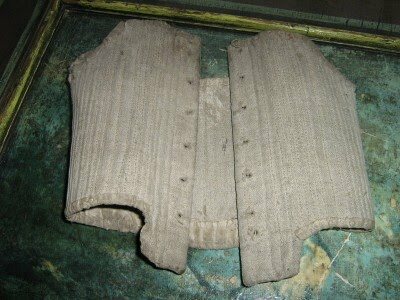 They are 16.5 inches wide and only 7 inches long at center back (the longest point). They are mounted on a baby mannequin. The white patch is an old paper label, not a part of the stays. Knowing that Center Back is 7 inches and we deduct one and a half inches for the protruding tab, the body of the stays at center back is only 5.5 inches long. There are two bones at Center Back, two slanted bones at Side Fronts and two bones at Center Front. 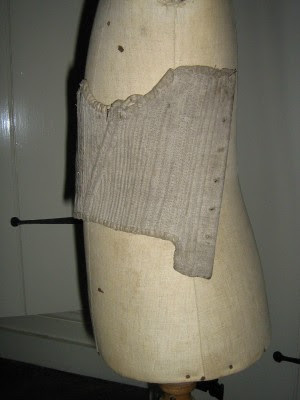 The back shows the typical configuration of eyelet holes for spiral lacing. The stitching channels shown here are not fully boned. 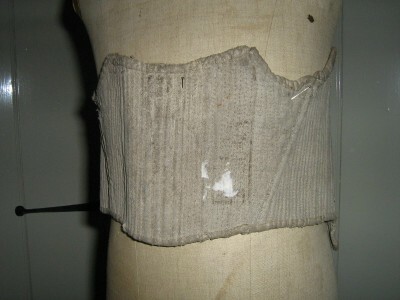 The top binding appears to be linen tape or folded linen fabric. It would be practical to have the entire garment washable!